Waterbury Clock Co. figure clock, "Viking", ca 1905. 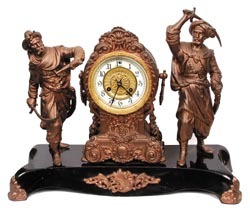 Double statues and clock tower standing on a black enameled iron base. Similar to Ansonia and other makers statue clocks. Cast metal with Japanese Bronze finish. Unlike Ansonia, the gilt has held exceptionally well. A little soap and water should be all it needs. 8 day, half hour and hour strike on a gong. 4-1/2" ivory dial, fancy gilt center Rocco cast gilt sash and bezel, beveled glass, all very good. The clock stands 14.5" high, 19" wide. Ly-Waterbury No. 505.